The integration of persons in keeping with their capacities, in the context of a globalized world, which does not mean putting an end to inequalities but primarily to poverty, explained the relators. 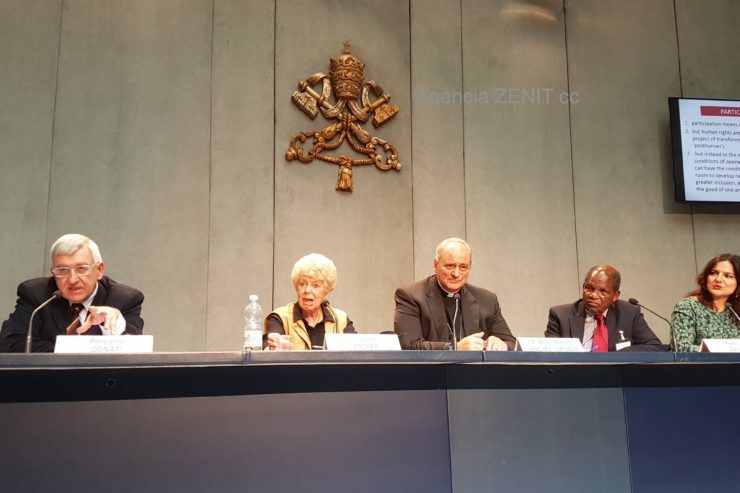 Doing so on Tuesday in the Holy See Press Office were its Chancellor, Bishop Marcelo Sanchez Sorondo, accompanied by the Academy’s President, Professor Margaret S. Archer; Professor Pierpaolo Donati of the University of Bologna and Professor Paulus Zulu, of the University of Natal, South Africa. Pope Francis sent a special message on the occasion of the Plenary, published on April 29 in L’Osservatore Romano, which constituted the background and theme of the works. The participants in the Plenary Assembly addressed the question of a participatory society, defining in the first place all the concepts of participation, struggle against social and cultural exclusion and integration, to then consider its empirical phenomenons, its causes and possible solutions. They are multi-dimensional concepts and processes which are not identical among themselves and yet are linked in several ways. Participation can be institutional or spontaneous. Exclusion can be active (intentional, as in the case of discrimination for reasons of ethnic or religious origin) or passive (due to accidental causes, such as a strong economic crisis). In both cases it is the result of processes that that have been analyzed in their generative mechanisms, given that social and cultural integration is the result of the modification of these mechanisms, which are economic, social, cultural and political. The objective of the inclusion of persons and communities in society cannot be pursued with forced measures or in a standardized fashion (for instance, with school systems that do not take into account the different cultures and the local cultures). Real social participation is possible only if there is religious freedom. The works manifested the concern over the spread of social fragmentation on one hand, and, at the same time, the inability of political systems to govern society. These two phenomenons are spreading in many countries and they create situations of strong social disintegration, in which it is increasingly difficult to create forms of social participation based on principles of justice, solidarity and fraternity. The causes of these disturbing tendencies that act against a more participatory society have been identified in the crisis of political representation, in growing social inequalities, in demographic imbalance at the world level, in growing migration and high number of refugees, in the ambivalent role of the technologies of information and communication and in religious and cultural conflicts. Undoubtedly, the most important factor against social participation is the growing social inequality between restricted elites and the mass of the population. Statistics on the distribution of wealth and opportunities of life show the enormous differences between countries and within them. Very worrying is the fact that in Europe and America the middle class has been greatly weakened, as opposed to other countries, such as India and China, where it has been strengthened. It must be pointed out that, when the middle class suffers setbacks, participatory democracy is in danger. Despite all this, one can work for a better “participatory society” as long as real subsidiary cooperation can be established between a political system that is sensitive to the voice of those who are not represented, a civilized economy and associated forms of civil society based on networks of reciprocity. It is necessary to create circular ways of participation from the top-down, and from the bottom-up, valuing the intermediate realities based on the principle of collegiality. In essence, a participatory society is one that defends and promotes human rights, conscious that legislation on them cannot achieve a utopic plan of social transformation, but only create positive conditions within which persons and groups can act ethically, that is, have the opportunity to dedicate themselves to the mutual good, and to prepare new social initiatives that generate greater social inclusion.